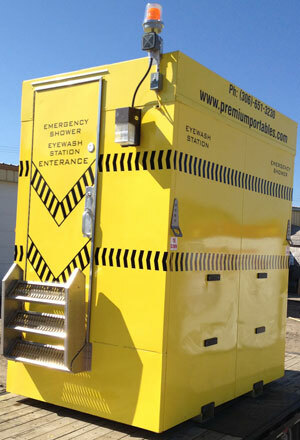 Emergency Shower and Eyewash Eye/Face Stations - Premium Portable Washrooms Ltd. The emergency shower delivers a precise stream of water that covers the entire body. The water pattern is 20 inches in diameter (50.8cm) and falls from a height of 60 inches (152cm) with a volume of 20 Gal/min (75.7 L/min). There is enough water to last a minimum of 15 minutes of continuous use. Activation is simple and takes less than 1 second to turn on and stays on by itself allowing single person use. Our emergency eye/face wash stations are designed to provide a gentle stream of fluid to both eyes simultaneously. Like the emergency shower, the eye and face wash station is simple to activate in less than one second and remains operational by itself. The fluid volume is 0.4 Gal/min (1.5 L/min) and has a capacity of at least 15 minutes.